SUNNYVALE, Calif.--(BUSINESS WIRE)--Embolx, Inc., a medical device company developing microcatheters for arterial embolization procedures, today announced that the company has received 510(k) clearance from the United States Food and Drug Administration (FDA) for its next generation family of Sniper® Balloon Occlusion Microcatheters, an innovative system for pressure-directed arterial embolization therapy. Now commercially available in the United States, the next-generation family of Sniper devices is a significant product evolution, offering physicians enhanced performance features to improve access and allow easy navigation through small complex vascular structures. Embolx’s next-generation Sniper microcatheter is now available in three lengths – 110 cm, 130 cm and 150 cm – now enabling interventional radiologist physicians to access either femoral or radial arterial sites. Advancements in the Sniper’s balloon and atraumatic tip designs allow larger vessels to be occluded and enhance the ability for Sniper to track inside vessels. “Our next generation devices incorporate experience from more than 1,000 Sniper balloon occlusion microcatheters used to date,” said Michael Allen, president and CEO of Embolx. “Now, interventional radiologists can do everything they would do with standard microcatheters, but with the added benefits of balloon occlusion. This is a big step forward and provides physicians with the most advanced transarterial delivery system for tumor and prostate treatment." The Sniper microcatheter alters blood flow‐dynamics by controlling pressure to increase therapeutic agent delivery into target areas. It is currently used for the treatment of cancerous tumors in the liver and other organs, enlarged prostate (also called benign prostatic hyperplasia), and uterine fibroids. This therapy allows the delivery of drugs and embolic agents to only targeted treatment areas, while protecting surrounding healthy tissues. "The great thing about Sniper's enhanced design and longer lengths is that it allows me to perform procedures using a transradial approach with the benefits of pressure-directed embolization. The ability to reverse blood flow using Sniper's balloon helps me to not have to worry about non-target embolization," said Aaron M. Fischman, MD, interventional radiologist and associate professor of radiology and surgery at the Icahn School of Medicine at Mount Sinai. "I can perform the procedure the way I want because of Sniper's wide range compatibility with different guidewires, guide catheters, coils and therapeutic agents." Embolization is a minimally invasive procedure performed by interventional radiologists where blood supply to organs or tumors are blocked after therapeutic agents are injected in a blood vessel near the treatment location. Embolx is an emerging commercial-stage medical device company in Silicon Valley developing microcatheters for arterial embolization procedures. Embolx is committed to dramatically improving the treatment of a variety of conditions including cancerous tumors, benign prostatic hyperplasia and uterine fibroids. 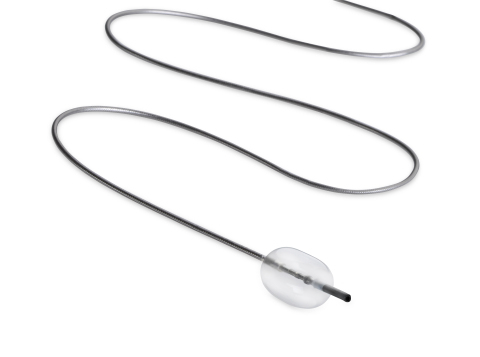 The Sniper® Balloon Occlusion Microcatheter sets a new standard for precise embolic delivery and superior target filling by controlling pressure to direct blood flow while protecting non-target surrounding tissues. For more information, please visit www.embolx.com.